A proposed merger between two nonprofit hospital systems will have impacts across the country, including in San Luis Obispo County. MERGER Dignity Health, which operates two hospitals in SLO County, and Catholic Health Initiatives are looking to combine forces as part of a proposed merger. That merger has raised concerns from state local women's health and LGBTQ advocates. 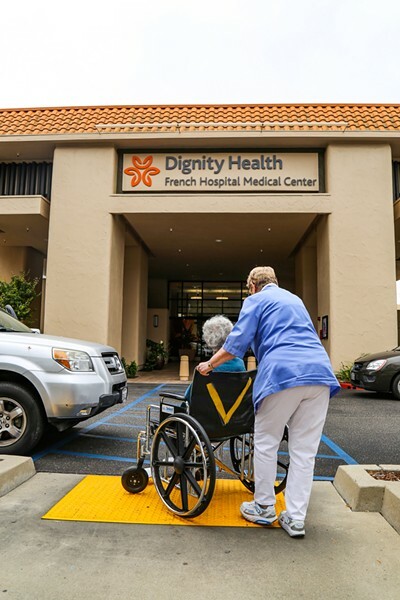 If approved, the merger between Dignity Health and Colorado-based Catholic Health Initiatives would create one of the country's largest nonprofit hospital systems and effect two local Dignity-owned hospitals: French Hospital Medical Center in SLO and the Arroyo Grande Community Hospital. While Dignity Health characterized the merger as an opportunity to create healthier communities, some worry that it could jeopardize heath care services for women, the poor, and the LGBTQ community, and are calling on the California attorney general to impose conditions on the merger to preserve those services or scrap the merger entirely. "I don't think the merger should happen at all," said Michelle Call, executive director of the Gay and Lesbian Alliance of the Central Coast (GALA). Much of the alarm the stems from concerns over the new system implementing ethical and religious directives set out by the Catholic Church on non-Catholic hospitals. Those directives govern how Catholic hospitals interact with patients, and place restrictions or outright bans on a number of medical services, including reproductive health services for women such as birth control, sterilization, miscarriage management, and abortion. LGBTQ advocates also say that the directives could allow hospitals to deny some services to transgender individuals in the process of transitioning and hinder efforts to create gender affirming health care environments for the queer community. "They are concerned that they won't be treated with respect and they won't receive the same standard of care," Call said. "They need to know that a hospital is coming from a place where it believes they have a legitimacy to exist." Currently, only some hospitals in Dignity's network adhere to the religious directives, but French and Arroyo Grande hospitals are two that do not. Instead, they are guided by a less-restrictive "statement of common values." According to a "ministerial agreement" between Dignity Health and Catholic Health Initiatives, neither hospital would be placed under the directives as a result of the proposed merger and would continue to operate under the statement of common values. "Our community partners such as the SLO Women's March and SLO County Gay and Lesbian Alliance have no reason to be concerned at all," a spokesperson for Dignity Health wrote in an email response to questions from New Times. "In particular to women's health services, ... these services will not be changed or reduced at any Dignity Health facilities as a result of this alignment." Those skeptical of the merger also raised concerns that it could imperil funding and services for the poor, uninsured, and underinsured individuals, also known as charity care. According to a recent independent report on the merger provided to the California Attorney General's Office, the ministerial agreement between Catholic Health and Dignity committed to provide charity care at Dignity-owned hospitals at an amount equal or greater to the three-year average at each hospital for the next six fiscal years. Despite the assurances provided by the agreement, critics of the merger are still wary of the possible negative impacts, and are asking state Attorney General Xavier Becerra to impose conditions on the merger to address their concerns. In California, the attorney general is responsible for reviewing and approving nonprofit hospital mergers and can deny them outright or require specific conditions for approval. "Agreements between executives are good, but it won't provide security the way that putting those conditions in writing by the attorney general can," said Anthony Wright, executive director of Health Access California. "We don't think the merger should go forward unless those conditions are met."